The Shannon estuary is one of the most important sites for the conservation of cetaceans (whales, dolphins and porpoises) in Ireland, as it is home to the only known resident group of bottlenose dolphins and is a known calving area. The estuary has been nominated as a candidate SAC (Special Area of Conservation) under the EU Habitats Directive. Under this Directive the National Parks and Wildlife Service are obliged to designate areas (SAC) for species on Annex II, these include bottlenose dolphins (Tursiops truncatus) and harbour porpoises (Phocoena phocoena). 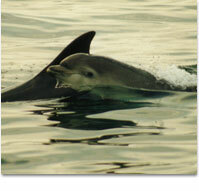 To date the Shannon estuary is only SAC in Ireland for bottlenose dolphins. There are two sites under discussion for harbour porpoise (Blasket Islands, Co Kerry and Roaringwater Bay, Co Cork) but these have not been formally designated.